As preparation for the 44th Amish Acres Arts & Crafts Festival that opens this coming Thursday, I search for ways to describe this event to others. There are so many people involved that I can only illustrate by example. 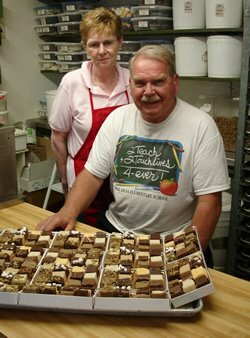 Nancy has just completed her initial fudge inventory for the festival:1,880 pounds! Hopefully that will get the fudgery through at least two days of the event. In 1962 I remember giving away a dozen dozen donuts and 20 gallons of refreshin' lemonade. The artists will eat and drink more than that before the show opens. Nancy is a perpetual motion machine when she is in her soda shop and fudgery. She not only makes fudge, but jerks sodas, fills wholesale orders--yesterday made 600 pounds of assorted candy trays for a Masonic gathering that had their reception in the Children's Entertainment that is already set up and decorated. Nancy is simply Exhibit A of the folks who are dedicated to the satisfaction her customers. The guy with her? That's her husband Bob. He's retired from the principalship of Woodview Elementary School in Nappanee. He gets up at 4:00 a.m. to pick up the Amish workers, then he supervises and is the taste tester. The American Bus Association, through its TOP 100 Events in North America, has named the 44th annual Amish Acres Arts & Crafts Festival number one in the nation. It opens next Thursday, but planning and activation this huge undertaking has been going on all year. My daughter Jenni is in charge of the marketplace where 386 artists and craftspersons are selected through an ardious jurying process. Nearly 1,000 aspirants apply. The final number tends to fall into 75% returnees, 86 exhibitors from 291 cities in 34 states. Sixty-nine are veterans of ten years or more (sixteen of whom have participated over twenty years). The ninety-four new artists hail from the far corners of Fort Collins, Colorado, to Hollywood, Florida; from Carlsbad, New Mexico, to Bowie, Maryland. They come because this is a private family fun affair in its third generation. They receive so many perks by being here many consider it their vacation from the grind of committee sponsored events in public venues. The $10,000 in cash prizes provides incentive to many. Some will walk away richer up to $1,500 so. I can't describe the complex set up that Elliott, Audrie, Alvin, Jeff, Jeff, Emma, Mike, Scott, Kristyn, Jeremy, Rita, Ruth, Frieda, Kathy, Becky, and a host of Amish Acres and festival employees that will number in the 100's by the end of next week. The undertaking is unique, there isn't another festival like it in America, but the rewards from organizing the gathered talent and appreciative visitors intent on buying provides an atmosphere reminescent of Brigadoon or Camelot, human interaction among diverse folk celebrating our shared, flawed world, in a peaceful, productive, and uplifting experience. Without that reward, no one could sustain this undertaking for 44 years.